With the news that Disgaea 1 Complete will release on Nintendo Switch, NIS America has announced the Disgaea 1 Complete: Rosen Queen’s Finest Edition. 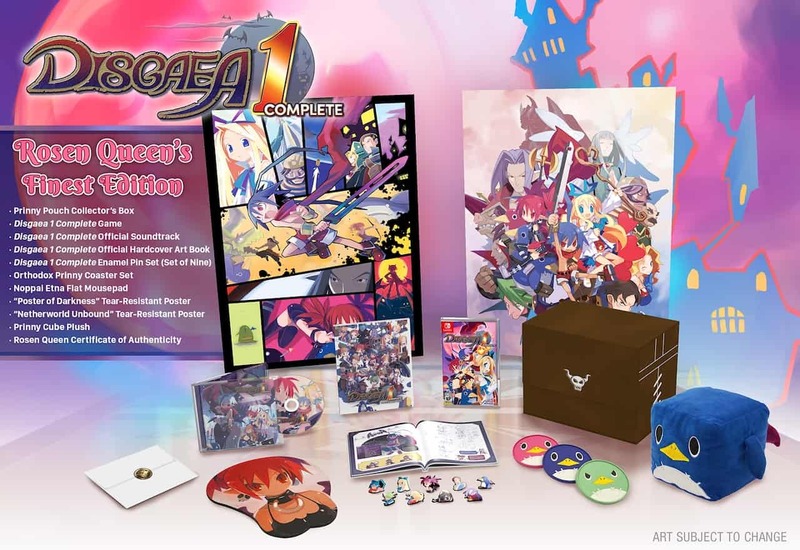 The Rosen Queen’s Finest Edition ($99.99), which is now available to pre-order on the NIS America Online Store, will include a physical copy of Disgaea 1 Complete, the official soundtrack CD, an official hardcover art book, an enamel pin set (set of nine), an Orthodox Prinny coaster set, a Noppai Etna flat mousepad, a “Poster of Darkness” tear-resistant poster, a “Netherworld Unbound” tear-resistant poster, a Prinny cube plush, a Rosen Queen certificate of authenticity, and the Prinny Pouch Collector’s Box. Disgaea 1 Complete will release for Nintendo Switch worldwide in Fall 2018.